Steve Presser with Julia Kious Zabell. 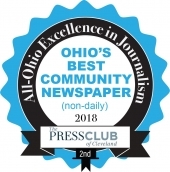 Julia Kious Zabell, board president of FutureHeights, presented Steve Presser with the "Champion of Independent Businesses" award, hand-crafted by Cleveland Heights artist Shayna Roth Pentecost, at the 2018 FutureHeights benefit, Living is Big Fun in Cleveland Heights. 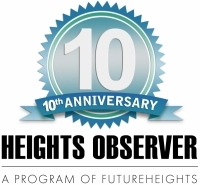 Deanna Bremer Fisher is executive director of FutureHeights and publisher of the Heights Observer.